To understand the heart of what we are trying to accomplish and who we are it is important here to distinguish between centered sets and bounded sets, for this goes to the heart of the difference between the two modes of church attractional and incarnational. The attractional church is a bounded set. That is, it is a set of people clearly marked off from those who do not belong to it. Churches thus mark themselves in a variety of ways. Having a church membership roll is an obvious one. This mechanism determines who’s in and who’s out. The missional-incarnational church is a centered set. This means that rather than drawing a border to determine who belongs and who doesn’t, a centered set is defined by its core values, and people are not seen as in or out, but as closer or further away from the center. In that sense, everyone is in and no one is out. Though some people are close to the center and others far from it, everyone is potentially part of the community in its broadest sense. Perhaps an illustration will make this clear. Think of it in terms as the difference between wells and fences. In farming communities farmers might build fences around properties to keep their livestock in and the neighboring farms livestock out. However, in the rural communities where ranches cover a lot of geographic area the farmers would create a well with the understanding that because the water supply is precious the livestock will not wonder to far from the well. That is a centered set. Churches that see themselves as a centered set recognize that the gospel is so precious, so refreshing that, like a well, lovers of Christ will not stray too far from it. It is then a truly Christ-centered model. Rather than seeing people as Christian or non- Christian, as in or out, we would see people by their degree of distance from the center, Christ. In this way, the missional-incarnational church sees people as Christian and not-yet-Christian. It acknowledges the contribution of not-yet-Christians to Christian community and values the contribution of all people. Jesus’ faith community was clearly a centered set, with him at the center. For us the center should be Jesus himself and the gospel is the central imperative for Christian mission. Since at the core of a centered set is Christ, a church should be concerned with fostering increasing closeness to Jesus in the lives of all those involved. We believe that a centered-set church must have a very clear set of beliefs, rooted in Christ and his teaching. This belief system must be nonnegotiable and strongly held to by the community closest to its center. such traits) are still seen as “belonging.” No one is considered unworthy of belonging because they happen to be addicted to tobacco, or because they’re not married to their live-in partner. Belonging is a key value. 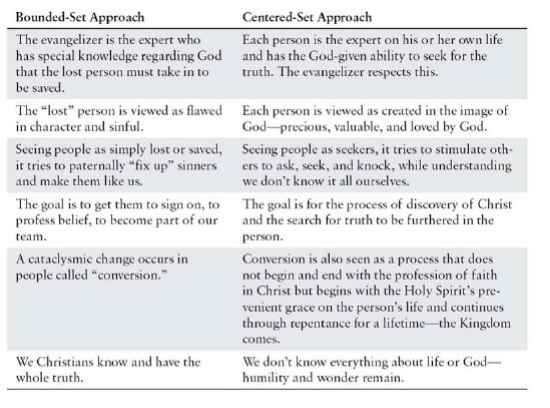 The growth toward the center of the set is the same as the process of discipleship. Some time ago I was watching my son play soccer in a local park. Next to the field was an asphalted area where a group of model-car enthusiasts had set up a track and were using remote controls to race their cars against one another’s. The constant buzz of the miniature motors caught our attention and we wandered over to watch what they were doing. We soon realized we had encountered a lost suburban tribe. Everyone looked the same. They all wore tight black jeans and checkered flannel shirts. on a Sunday morning they met to race each other, to discuss the latest designs in model cars, and to drink and laugh and build community. write your answer down continue to read to see if you have an attractional or missional in your approach. The attractional models approach would hold special services for model-car racers. It would design an excellent flyer explaining that Jesus loves model-car enthusiasts, and they would place one under the windshield wipers of each pickup. It would try to find a recently converted model-car enthusiast and have him share his testimony in one it's meetings. The attractional church model would seek to do anything it could to draw the car racing fraternity into its meeting or building. This might even work if you’re dealing with a localized community with some geographic proximity to the church building. But a car club community usually draws people from a very large geographic area. The model-car club is probably a citywide community, and its members probably drive great distances to come to its monthly meetings. They are not drawn together by some geographic proximity, but by a commonly held interest. And to complicate matters further, they meet on Sunday mornings! The attractional church is stuck! Even though it has a close-knit community of people (likely non-churchgoers) right outside its door, it has no mechanism for sharing Christ with them. Since they (the car club members) are not likely to turn up at the church service one Sunday the only way to share Christ’s love with them must be to go to them. It would be a decidedly missional choice if a few members of a local church, so moved by compassion for the car enthusiasts right across the road, chose to buy a model car and join the club! This would be the kind of thinking and acting we’re talking about. If the spirit of our missionary God were to sweep through such a church, we don’t doubt that the church itself might buy a few model cars and commission some of its members to miss the morning service so they can fully enter into the community of the car club. By racing cars and repairing cars, they could earn the right of relationship to share their thoughts on life and their love for Jesus. This is the missional church in action. If a few car racers came into relationship with Christ, they should not be encouraged to leave the club and join the church. Rather, a group could be established, and the brand-new Christian car enthusiasts could worship God in the context of their tribal identity. This introductory section has introduced you to several concepts a Chi Alpha missionary needs to be aware of. We discussed the condition of the church to help you understand the that the current methods and model churches are offering are not working and really aren't replicable if our goal is to reach the world for Jesus. This awareness helped us to assess our missionary context by using two scales, the E-Scale and the P-Scale. These scales help us measure cultural distance. In doing it has made us aware that the world has changed around us and for us to reach the lost there is not only distant Christians much travel to bring the gospel, but a distance new converts must travel to hear the gospel. This awareness has helped us understand that the church model for ministry has been one that is attractional, meaning one that wants the lost to come to them. Understanding that we can now see that, as Chi Alpha missionaries, that placing the burden of conformity on the lost to break into the culture of the church is really the opposite of what it means to be missional. Being a missional missionary is not something we simply do but it is something we are since sentness is rooted in the Character of God. Therefore, we need to be aware of how deep the attractional church mindset is rooted in us, so we do not make the same mistakes in our missionary context. Therefore, to truly be Christ's ambassadors we take the idea sentness very serious. So much so that we organize around the idea understanding that Christ is a the core. This calls for a process of unlearning past attractional ministry approaches to learn new ones. The missional approach seems to be one that is concerned about developing the right DNA in its people so the right culture is created for a movement of God. While the current church model is very much attractional, dualistic, and hierarchical, In Chi Alpha we wish to take a different approach in the context we are called to. Chi Alpha missionaries should be incarnational, messianic in their spirituality, meaning having an understanding that there is no such thing as sacred or secular, and create an apostolic leadership base. Therefore, we are a people that are sent who train people to be sent. Right now these concepts may seem overwhelming or maybe even a little scary because it is not what you are used to, but be encouraged because as we work through the next few modules in your training you will be transformed by what God is going to do in and through you as we take on his characteristic of sentness.